Some native plants are very particular about their preferred soil type and structure. Soil fails to compact and runs through your fingers. Soil compacts slightly but still fragments through your fingers. Soil remains as a solid mass. Structure is the way soil particles group together. Some soils, such as beach sand, have particles which do not cling together and therefore have no structure. Some clay soils cling together in one solid mass and therefore also lack structure. Well-structured soils break up easily into fragments of irregular shape and size. These fragments do not completely fill the space they occupy, leaving a network of open spaces and passages in which plant roots can grow and allowing water and air to be taken in and excess water to drain away. Most plants need air and water near their roots to grow well. Have little ability to hold water or retain fertilizers, and are naturally very low in plant nutrient. They make an excellent mulch, however, it is difficult for plants to survive in them unless clay and loam are added to hold moisture and nutrients. Deep rooted plants from gravelly soils, once established, will survive in them, because moisture is often present at depth. Have similar characteristics to gravel but do retain some moisture, especially as depth increases. Often sandy soils become more compacted as depth increases and tend to have more of a sandstone profile. Their drainage is excellent and many plants from sandy areas, such as Western Australian Banksias, have adapted to survive in these nutrient-deficient soils. The top 100mm plus of sandy soils can be water-repellent due to wind-blown particles. This can be overcome by digging in humus, clay or loam soil to give a much better water retention profile. Alternatively, the top 100mmm plus can be removed from the proposed planting area to expose the more porous sand below or soil wetting agents can be used. Near the sea, calcareous soils may be found which, due to their poor structure, accept very little moisture and it can be very difficult to establish a garden unless using local native plants. Often found where market gardens were once established. Much of south-eastern Melbourne consists of these soils. They have good drainage while retaining some moisture and allowing plant roots to readily penetrate downwards. Many native plants are easily grown in these soils. Heavy soils that can retain a lot of moisture, but when they dry out and crack they are hard to dig. They have plenty of plant nutrients. To make clay soils more friable , add gypsum at a rate of 1kg per square metre repeating the treatment at yearly intervals if necessary. Ripping the soil when the gypsum is added will help it penetrate further down, and adding sand and humus also helps improve friability. Many native plants grow well in clay soils. friable soil = one which can be easily fragmented or broken up allowing easy cultivation. 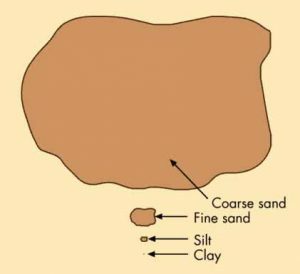 This is a rough guide to Victorian soil types. For more precise information on the soil types where you live, consult with your local APS Victoria District Group, obtain a soil map from your local Catchment Management Authority and check out information available on line from the Victorian Department of Environment and Primary Industries bioregions web site. 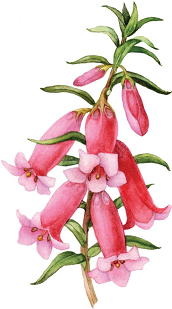 ‘The Flora of Melbourne’ – APS Maroondah – has detailed information about, and maps of, soil types in the Melbourne area. Brown clay soils that are more friable at the surface. The rainfall is about 400-500 mm in this region due to the Brisbane Ranges uplift causing a rain shadow. The winters are cold and wet and the summers hot to mild with numerous cool changes. Heavy grey-brown volcanic soils. It is difficult to grow a wide variety of native plants in these soils. The Silurian-derived sedimentary soils have broken down into light grey loams over clay. The tertiary sands have formed dark grey sand or loam over clays, characterising the former market garden belt. 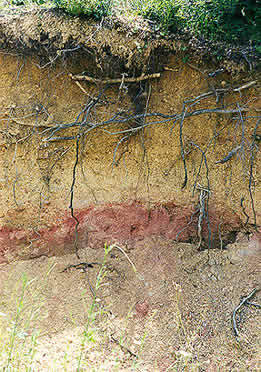 Red-brown loams that are rich in nutrients and exposed to high rainfall. The foothills to these areas often have dark grey sands or loams over clay and can support a wide variety of plants, especially of the Heath type. Most of the area consists of sandhills overlying limestone deposits. The soil is alkaline and poor in nutrients. The low rainfall makes it difficult to grow plants other than from inland areas. Along the Murray River the sands are more loamy and less alkaline and with the aid of irrigation water the range of native plants which can be grown increases. The summers are very hot with most of the rainfall occurring in the winter/spring period. Much of the region has been cleared for farming as the soils are generally heavier. The northern part merges into the Mallee sands and to the west the sandy country is much flatter, with some high ridges. The latter have more loam content in them and combined with a higher rainfall to 500mm, are able to sustain taller shrubs and trees. A large area of the Wimmera consists of heavy clay soils which have a higher proportion of sand grit in them, enabling the sowing of cereal crops, etc. Most soils are still alkaline and the climate consists of hot summers and wet winter/springs, although rainfall can be very erratic. This region stretches from the Loddon River in the west to Yarrawonga in the east. It is mainly flat with numerous streams traversing the country side. The soils are mainly clays but clay loams to loams can be found in fruit growing areas. Along the major rivers there are some sandhill deposits which are excellent for growing Proteaceae species. The summers are hot and generally dry and the winter/springs wet, although the rainfall can be very erratic. There is a great variety of soil types here as the region extends from the flat country of the river systems as they flow north to the Murray River, to the alpine areas of Mount Hotham. Here are also the granite outcrops of the Warby Ranges, Strathbogie Ranges and the ranges of the Beechworth and Cudgewa areas. The lower slopes of these ranges often have deep loamy soils with underground moisture. The flat country is generally made up of clay soils but as the streams head back into the hills, better clay loams appear. East of the Strathbogie and Beechworth Ranges, the hills consist of richer clay loam soils and taller trees and shrubs occur. The rainfall is considerably higher. Also in the hills there are some volcanic outcrops of rich red brown friable clay loam soils which sustain lush vegetation. The exposed alpine area is covered in snow in winter and consists of shallow soils in amongst outcrops of shales and schists. Below the snow line the soils become friable clay loams to loams and support forests with thick deposits of leaf and bark matter. The slopes are steep, the rainfall high and much more uniform throughout the year. This region takes in much of the Great Dividing Range from the Grampians in the west to the high country around Mansfield. The Grampians is a sandstone region and soils around the perimeter slopes consist of loams, which will support a large range of native plants. Further east there is a wide range of rock outcrops from shales to granites and soils vary from clays to loams. Interspersed, and particularly to the north of the great divide, are the goldfield soils characterised by the box ironbark forests and clay loam soils, which have been so extensively dug over that much of the original loam soil has been replaced with clay loams mixed with quartz. In the Kinglake, Gordon/Macedon areas, rich volcanic soils are encountered. The region has a wide variance in rainfall. The northern slopes are characterised by cold, wet winters and hot dry summers whereas the southern slopes have cold, wet winters but the summers are milder, due to westerly changes and some moisture. The volcanic plains of the western district consist mainly of heavy grey/black soils with volcanic rock outcrops. Combined with a higher and more regular rainfall they tend to be more friable at the surface, but crack extensively in summer. Towards the South Australian border the soils are derived from marine deposits and are more sandy to clay loam formation. Along the coast, coastal sand dunes have been formed and at Tower Hill the ash bed has broken down to very friable grey soils. Here sedimentary rocks have been uplifted and then eroded to form mountain ranges. The soils are generally friable loams to clay loams, rich in humus in forest areas. The area experiences high rainfall and cold winters and plants need good drainage to do well in these conditions. Coastal soils are mainly sandy loams but further inland soils become more clayey. From Warragul to Mallacoota the ranges rise up to join the Alpine areas. The soils are mainly friable clay loams giving way to rocky shale outcrops near the snowline. Interspersed are some volcanic red/brown soils as found on the Errinundra Plateau. Most of this area is national park or forest reserve. Along the river valleys, clay loams have been formed in the Latrobe and MacAlister river systems but near the coast and further east the river systems consist of more loamy soils. Rainfall is high in the mountains north of Warragul but further east, rainfall declines to 700 mm and long periods without rain can be experienced. A soil’s degree of acidity and alkalinity is determined by measuring its “pH”. pH measurements are expressed as a number on a scale from 0 to 14 where 7 is neutral, less than 7 is acid and greater than 7 is alkaline. Most soils have pH values between 3.5 and 10. In higher rainfall areas the natural pH of soils typically ranges from 5-7, whereas in drier areas the range is 6.5-9. Soils with pH values of 6.5 to 7.5 are referred to as ‘neutral’. Those with pH less than 6.5 are acidic, and soils with pH less than 5.5 are considered strongly acidic. To determine the pH of your soil buy a soil pH testing kit, or take soil samples to your local Department of Primary Industries for analysis. Plants that grow in alkaline soils will grow in acid soils, but the reverse will not work. Most plants around the southern and eastern part of Australia grow in acid soils, however in inland Australia the soils are more likely to be alkaline. The acidity of soil can be reduced by adding lime or dolomite, and alkalinity reduced by adding sulphur. To ensure the desired soil pH level is maintained, these treatments may have to be repeated at regular intervals.